Tritium has opened its European headquarters in Amsterdam with training and testing facilities to suit local market demands. 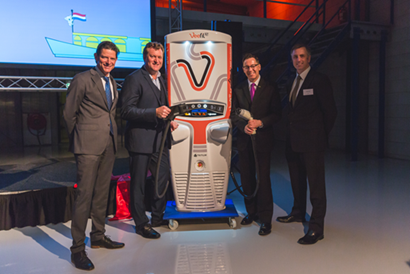 As part of its strategic development plan to take service, support, sales, training and manufacturing of its electric vehicle (EV) fast-charging products closer to customers around the world, Australia-based Tritium has announced the official opening of a European Headquarters in Amsterdam, The Netherlands. The facility will be the centre for its sales programme across the territory and also house a state-of-the-art training and accreditation unit for technical servicing and customer support. In addition, it has the capability to customise its product range to meet local market needs and specific customer requirements. A major feature of the Amsterdam site is its ‘in confidence’ testing centre, available for use by car manufacturers. As a privately-owned company with no strategic partnerships in the automotive sector, Tritium is able to offer comprehensive and confidential testing facilities for any automotive vehicles ‘behind closed doors’. Tritium is an specialist in developing infrastructure systems for the EV sector globally and is already a major supplier of fast chargers to the region, having taken around 20% of the western European market since the launch of its Veefil 50kW DC range in 2013. It has supplied over 50% of the DC fast charging units operational in Norway and is looking to develop its sales further in regions such as Germany, UK, France, BeNeLux and Scandinavia, where its distinctive Veefil range is already installed on charging highways and in city centres. “The opening of this facility represents a major investment and commitment to the European market,” explains Jeroen Jonker, Tritium’s General Manager – Sales Europe, “and it’s in direct response to increased demand for our products and services from this region. In just a few years Tritium has made a significant impact in the fast-charging sector and we needed to have a local presence operational in Europe ahead of a very active year, when we’ll be launching a number of new initiatives. “Europe offers enormous potential for Tritium and the market is extremely exciting for us. Thus far, we have been very successful in deploying charging infrastructure in the Utilities & Network sector and partnering with leading CPOs and back-end providers. The recent surge in new EV model launches in Europe has sparked increased interest in our Veefil range of 50kW Fast Chargers and Ultra-Fast Chargers (150-475kW), for both urban and corridor charging. Tritium is working closely with companies in the European Automotive and Petrol/Retail industry, in order to provide the best suited and most efficient fast charging product in the market. Tritium is also in the process of building a network of service partners across Europe (who will receive specialist training and Tritium accreditation) as part of the company’s continuing development of customer support. Amsterdam is the second overseas facility opened by Tritium in just over a year – its first international facility in Torrance, California, USA opened in 2017. Four months ago, Tritium moved into a larger global HQ facility in Brisbane, which has given the company the capability to increase production seven-fold.